We are well into trade show season here at East Coast Chair & Barstool and we are excited to be heading to Chicago next! Trade shows allow us the opportunity to make connections with customers and feature some of our newest products. So, we are packing our bags and heading to McCormick Place once again. In case you haven’t heard, the National Restaurant Association Show has reached their centennial year! This event is one of the biggest trade shows in the restaurant and hospitality industry. It is a great way to explore and learn everything that is happening in the industry. Discover innovations in equipment and supplies, to food technology, and even the latest furniture trends. In our experience, it is best to leave yourself at least two days to delve into all the exhibits. This year the show will be featuring a panel discussion on the future of dining, moderated by Dawn Sweeney, President & CEO of the National Restaurant Association. Attendees can expect to come away with insight into trends and potential industry-altering changes. As a session with Allison Page, Chief Product Officer and Con-Founder of SevenRooms, and Christopher Thomas-Moore on Vice President of Global eCommerce & Digital Marketing for Domino’s Pizza on the everything from robotics and automation of technologies to ease operations in back-of-house. 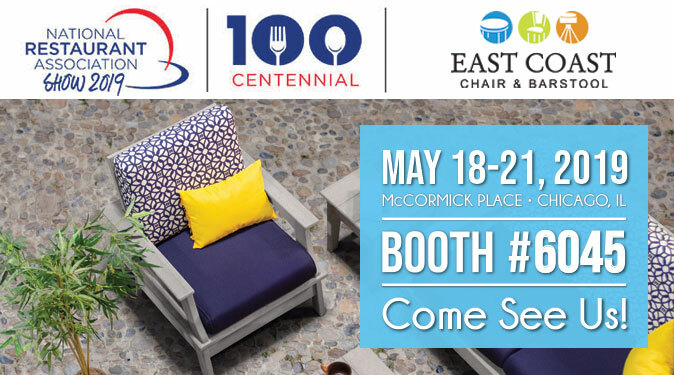 We are excited to be exhibiting our brand new outdoor deep seating option, The Monaco Collection of outdoor deep seating, several new restaurant booth designs, and modern designed Emory Chair. If you are around the Chicago area, make sure to come out May 18th-21st for the NRA show and stop by booth #6045. We’d love to meet you and discuss what we can do for your restaurant.